This is the end of the story… the experiment fails. I love New York. I had been away from home a week a month for 4 Years. It’s 2008. I’m in the CEO’s office of the world’s largest media buying company. He’s built this company over 20 Years. They’re considering buying my marketing technology company. And, Its October. The Dow just closed 9,000 points down in one day. Russia, London and Hong Kong all follow with historic losses. The US Senate proposes an $800 billion bailout. He likes what he sees. We’ve got good tech that opens tracking methods that will increase profits. Scotch at the Bull and the Bear tonight! The phone rings and the CEO excuses himself. …He returns. Something’s wrong. He tells us how he’s built this business for decades. It’s about people he explains. He’s provided for families and although it’s a multibillion-dollar business, they care. He’s never laid off anyone in 20 Years. Until today. 300 people just lost their jobs. More would follow. Less than a month later, an unknown “person” publishes a paper that promised “a system for electronic transactions without relying on trust”. 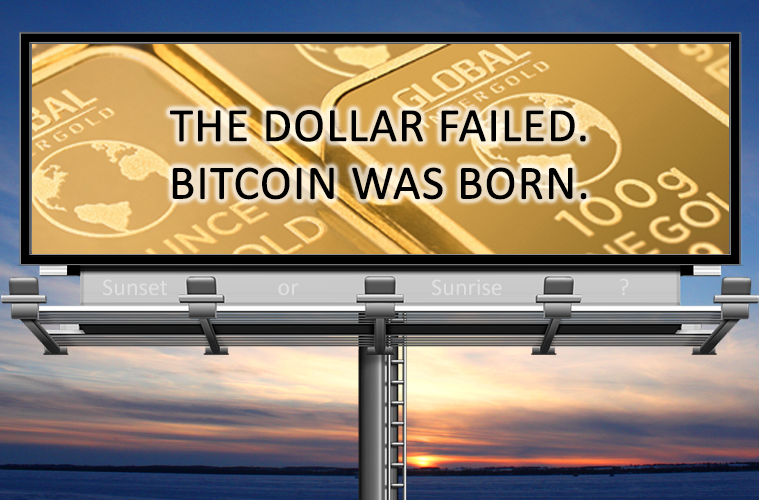 Bitcoin was born. The great experiment – Fiat is born in America. Note: this is a US-based example and I know and appreciate that we have an international audience. However, the effects of this brief history were global. I learned something recently. A “Fiat” is a decree by an authority. For money, it literally means the government authority decrees that the money is worth something. In 1971, the United States Government made a decree. No more gold-backed dollars. This created Fiat currency in America. A new financial experiment begins – The government is free to borrow and print money without having to back it by anything. Gold soars from $40 an ounce in 1972, to $800 in 1980. A 2000% increase. Ronald Reagan is elected in 1980 and a prosperous decade begins. The PC is born. Microsoft, Apple and Intel soar. The Soviet Union breaks up. The US begins printing more money. Government spending and the national debt begin to grow like never before to an all-time high. The financial experiment continues. Marc Andreessen creates a new script language (Mosaic and HTML) and the World Wide Web is born. The mid to late 90s see web companies bringing new innovations. Valuations on startups are crazy. AOL buys Time-Warner. A bubble begins. The government is actually making money(taxes). The national debt falls… the experiment is working. In July of 2000, the US Courts decide to break up Microsoft. A pin strikes the bubble and it bursts. Jobs are lost. Disaster lurks. To save the day, the government makes money cheap. Interest rates go to almost zero. Businesses borrow and the economy takes a hit, but continues. Real estate is cheaper than ever due to low interest rates. Housing begins to flourish. National debt begins to grow again and we’re printing money like never before. Gold hits a 12-year low. The experiment is tested, but it holds together. Low interest rates and new-found greed cause a housing bubble. The housing bubble Bursts. It’s the worst financial crisis since the great depression. Banks collapse. The entire financial system is in ruins. Gold soars to $2000. The experiment fails. I don’t blame the financial system or the government for the bailouts and the spending that came next. The alternative was total collapse. Their answer was new regulations and spend, spend, spend. The experiment failed and their answer was to do more of the same: Increase the debt, spur the economy through low-cost money and hope for a different result. In 1971, the world changed. The United States created an experiment that was tested a twice, and then failed in 2008. At best, they patched the experiment, and that patch has helped for a decade. I don’t think anyone believes there is not a day of reckoning for the debt and spending the United States continues to this day. Bitcoin was some people’s answer to this failure. And it caught on enough to grow exponentially for 9 years. Enough to create its own bubble. Cryptocurrency soars to a market cap of $832 billion in January of 2018. But, since January, the 75% decline in the entire market cap seems to say it was in a bubble. We are now at a $207 billion market cap. But this bubble wasn’t big enough to make a huge difference in the economy. Is bitcoin or cryptocurrency the answer to the great experiment? To be honest, I don’t know. Sorry. It’s possible, but whatever starts to replace FIAT and becomes a means of transactions and a store of value has to learn from the past. Not all tokens are pretending to do this. Some, like Bitcoin, Litecoin, Ethereum and Bitcoin Cash, are princes waiting to be coronated to the money throne. However, most tokens are created for a private token economy to support a goal, a project or a cause. Both types have a tremendous opportunity. If cryptocurrency is the answer to a better financial system, it to be better than the current system and learn from its mistakes. I am not ready to say bitcoin is the solution. Bitcoin is better at many things than fiat. But it also suffers from technology issues and the inability to adapt. Like the dollar, it has no backing. There is no asset that backs the value. It has hope and a unique position. Outside of bitcoin, most cryptos suffer from the same flaw that the dollar does. There’s no asset to back them. Many have no company producing a profit to share with token holders. And with some, there is no tie to the project’s success. They exist because the company/project decreed they are worth something and people believed it (hope) – sounds like the dollar to me. These cryptos are fiats in disguise. They have value by decree. That value will last while hope is alive. Hope will not continue forever and will be challenged. Can you fix your token? For a cryptocurrency to have a chance to survive, it must have all the advantages it can get. It should have the full support from the project and team that created it. It should have business principles applied that produce a sustainable economy. Even if that currency becomes completely decentralized and unowned, it still needs solid principles that keep it alive, stable, useful and adaptable. Even then, its chances of survival are 10% (see the previous article). I’ve assembled some suggestions. Some tokens may be too far down their detached fiat path to make a change. But for others, the more of these suggestions your token has, the better chance it has of surviving. Same goes if you are designing a token or evaluating a token or ICO for purchase. Your token can fit more than one of these areas. Equity token – Back your token with the value of the company. This would make the token a form of stock. An equity token keeps motivations aligned between the project and the token. Asset token – Back your token with an external asset. There are many projects springing up that would be considered an asset token. Real estate and precious metals like gold are two big examples. The upside of this is, the downside is lower. Meaning, even if the token is trading at 3 times the asset value, there’s a stop-loss in the asset itself. Some would consider another downside in that the token speculation is dampened, meaning it can’t appreciate without the asset appreciating as well. That’s true. In other words, a token tied to an asset can’t grow as fast as an un-tethered token. But is that really a downside? Dividend token – Tie the profit of your project to the token. This is becoming more popular. Why shouldn’t those who gave the money to fund the project also get value beyond the appreciation of the token? The answer is they should. The downside for many projects is they did not even build in a revenue or profit motive. Those projects will eventually run out of money and die (see the previous article). Increase the Utility of your token – I am sure most projects believe they are already doing this. This is one area where I personally believe many founders need business help, even if they are a foundation. According to an ICOBox study a primary reason for ICO failure is founders thinking they can do it all. Creating and sustaining value is not easy and is always better with experience. Its not easy to create a market, find sales channels, close deals, get partners, provide support, cut costs, and sustain this. Get help! Be critical of yourselves and find ways to support the token holders. Be honest, they primarily got into your project to make money and partially because they believed your vision. Without money, your vision will not survive. This may be had to swallow – Change your vision if needed. By now you know I’m encouraging token-based projects to begin applying sound business practices, even if they are non-profits. Business practices and sound economic principles did not change with the invention of cryptocurrency. The dollar changed in 1971 and the financial system broke. Some form of cryptocurrency may be the answer, but most likely it will need to be an asset-based cryptocurrency to give it backing, stability and trust. While your token may not have the goal to be a fiat currency replacement. The same principles apply. Value by fiat and hope is not enough. Take a hard look and give your project and token holders a reason to hope.